and you don’t deserve it. Do you want to know what I still remember from “The Commuter“? Well, actually it’s not that much anymore. It’s that kind of movie. Only the opening scene where you see Michael MacCauley (Liam Neeson) performing his recurring morning ritual. From getting up to the ride to the metro station with his wife. A unique piece of film? Or is it a copy of the opening scene from “Rebirth” where you see the protagonist performing his daily morning activities as well? A way to demonstrate the daily grind of working people. Only Michael’s daily pattern is being discontinued in a rather harsh way when he’s being fired at work, where he has been selling life insurances for over 10 years, at the age of 60. And after that, there’s this unknown beautiful woman (Vera Farmiga) who makes a hypothetical proposal. He has to take a bag from another traveler on the metro in order to protect himself and his family from a financial catastrophe. Sounds simple but essentially it’s a task that should not be underestimated. Come on Liam. You can do better. It seems as though Neeson got a patent on this type of film where he has to work against the clock to complete a task, commissioned by unscrupulous criminals. And time and again it is his family that is also threatened. 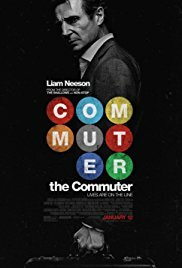 “The Commuter” is a bit “Non-Stop” and a cross-section of all the “Taken” episodes. And this time it takes place on a train. But to be honest, at a certain moment I thought it was enormously exaggerated and implausible. For a movie night where you can turn off your brains for a while, such that they can enjoy a well-deserved rest, and you can gorge on homemade popcorn, this film isn’t that awful. But dear Mr. Neeson. Isn’t it time to take a different road and diversify your work a bit? Don’t be tempted always to play in the same kind of movies with just a different environment and set-up? After all, you aren’t getting any younger. Right?